I was born and raised Catholic and throughout my entire life the 40 days prior to Easter I've struggled deciding what I'd "give up." I believe its important to make a small personal sacrifice in light of the huge sacrifice Christ made for us but the decision on just what to give up is never an easy one. Wine, beer, alcohol in general, eating out, cursing, drinking caffeine: all great options but this year they just don't fit the bill. This year I got my inspiration from a coworker who suggested running at least 1 mile each day. For some reason the idea resonated. It will be difficult because I know I'll have to wake up early several times a week which is a sacrifice. Also, I would be improving my overall health, which I have to think God would look upon favorably, since my body is my temple. More importantly I think it is appropriate because when I run my mind is clear and typically I set aside anything that might be weighing on me and I actually pray. 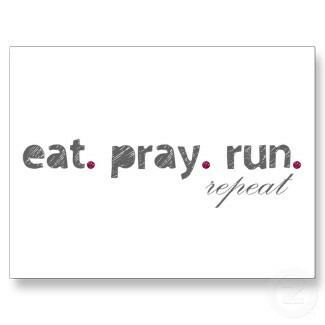 So by running more, I'll be praying more. I've decided to only run 5 days a week, since I know it can actually be harmful not to give your body occasional rest from exercise. But I'll likely run 2+ miles instead of just one. You don't have to be Catholic in order to make a Lenten sacrifice, are you planning on giving up anything this year? If so, what? I gave up Facebook this year because 1) it's a waste of time and I get sucked in and 2) I realized I'd been checking it out of compulsion because 90-95% of the posts on there are not that interesting, but I feel like I have to look!